A few weeks ago, I talked about the first model kit I was planning on working with. This week, I’ve decided to let you know what I’m looking at doing with it. 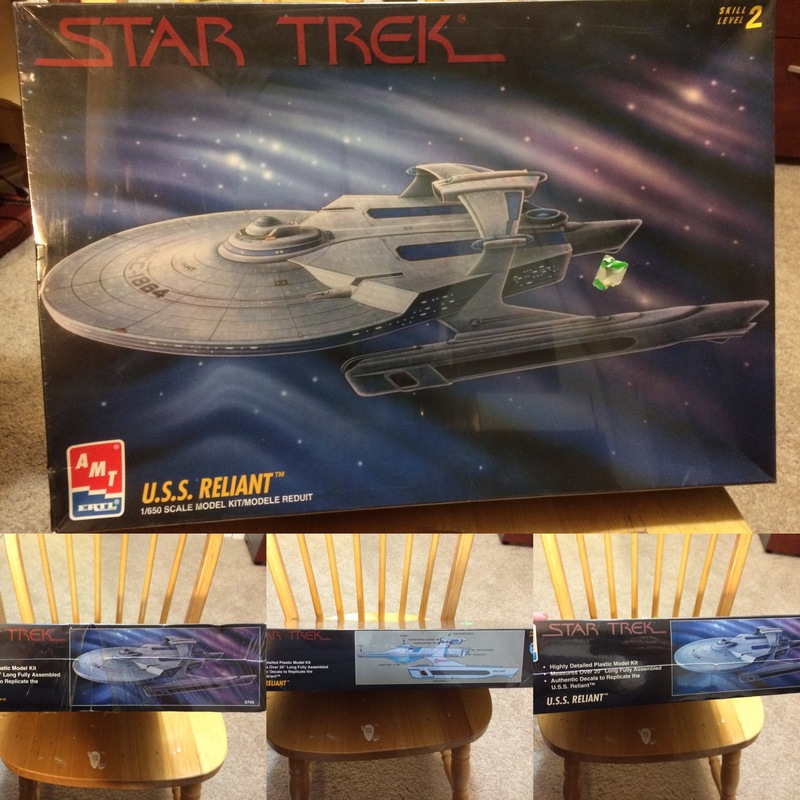 The model kit I’m working with is an old AMT/Ertl kit of the USS Reliant, as seen in Star Trek: The Wrath of Khan. The kit itself looks like it was issued in 1995, so it’s over 20 years old. First, this means that I got a good deal, especially when you look at this Amazon Affiliate Link, but it also means there has been plenty of time for model builders to come up with better decals, additions, and more accurate pieces, which they are more than happy to sell on the internet. This is what I’m going to look at today. However, before I begin, big thanks to the folks over in the General Modeling Forum on the RPF for helping me find some of these. First, there is the Miranda Class Saucer Correction Kit from Federation Models. There is no direct link, but it can be found about twelve items down on this page, if the link doesn’t already bring you to it. This “spacer” kit helps to correct some inaccuracies in the thickness of the hull, as well as make the rear of the ship a bit more accurate. Six items below that, they have a Miranda Class Shuttle Bay Kit, which includes the Saucer Correction Kit, but they are out of stock, and lord only knows if they’re ever going to make more, due to the age of the kit, so I’m going to focus more on the Correction Kit. Next up are some additions from Don’s Light and Magic. This site has some cool pieces, especially if I’m looking to light up the kit. These include a replacement for the bridge dome, as well as engine pieces cast in clear blue resin for lighting the warp nacelles (which I need to research more, because I’m not 100% certain these were lit in Wrath of Khan!). Finally, they have decals to replace the ones that come with the kit, to help improve accuracy in that regard. All of these can be found most of the way down this page, after all the pieces for the Enterprise Refit. The next thing I’m looking at is because I’m feeling rather adventurous, and I want to really test my patience and skill level. If you aren’t aware, a lot of the ships in the Star Trek universe weren’t just one flat grey or off-white color. Instead, they had multiple shades of grey, known as an “aztec” pattern, to help make the ships look a bit more detailed, and realistic. In my eyes, it means I have more painting to do to make them look good, and painting is not my strong suit! However, over on the CultTVman site, there are patterns for these paint applications, by someone called “Aztek Dummy”. So, these are also now on my list of items to get for the model. Didn’t I say I was trying not to spend money this year? But wait, there’s more! Part of why I’m replacing some pieces with clear pieces, and looking to correctly drill out windows, is because I want this model to light up, as well. Lights just help make a model more impressive, in my opinion, so I’m going to try my hand with that, as well. After doing some searching, and finding kits for the smaller, more recent Reliant model kit, I finally found a light kit at Galactic Modeler for this version of the ship. The cool thing is, it includes everything, so I won’t have to also order the wiring, a soldering iron, or the LEDs. This is the kit, and it runs $65.95. This runs the total up to $155.90. This is before paint and primer, tape, filler, glue, hobby knives, and other tools I’ll need to get this taken care of. So, in case you can’t tell, this will be a very slow moving project. This means a few things. First, I need to figure out a place where I will build the kit. I would like someplace where I can lay it out, and not have to worry about packing up pieces when I’m not building. Right now, I’m thinking about placing a table in the corner of the office that you see behind me in all of my videos, but I’m not 100% sold on that yet. Next, I’ll be making a page for this here on the blog, and setting up to shoot videos talking about what I’m doing, what I’m learning, and what I will inevitably mess up on. I’ll start a new YouTube list to cover this, and we’ll see where that goes. Finally, I’m hoping to eventually end up with a really nice version of the USS Reliant, when all is said and done, and not just a bunch of plastic with crooked decals, sloppy paint applications, and model glue smeared everywhere.